This name uses Spanish naming customs: the first or paternal family name is Pékerman and the second or maternal family name is Krimen. José Néstor Pékerman Krimen (Spanish pronunciation: [xoˈse ˈpekerman]; born 3 September 1949) is an Argentine football coach and former manager of the Colombian national football team. As a youth level coach for Argentina, he won the FIFA World Youth Championship three times, and the U20 South American Youth Championship twice. He coached the Argentine national team in the 2006 FIFA World Cup and became coach of the Colombian national team in 2012. He subsequently managed the Colombian national team during the 2014 and 2018 FIFA World Cups where he led the team to their best result in 2014. Pékerman's career as a footballer was uneventful. A midfielder, he played from 1970 to 1974 for Argentinos Juniors scoring 12 goals in 134 matches. He was transferred to Independiente Medellín, in Colombia, where he scored 15 goals in 101 matches. His career as a player ended at age 28 with a serious knee injury. Pékerman was then forced to support himself and his family with various odd jobs, including a stint as a taxi driver. Back in Argentina, Pékerman worked as a youth coach for Chacarita Juniors and then occupied the same position with Argentinos Juniors. He then moved to Chile to coach Colo-Colo's youth divisions. In 1994, he was offered to coach the Argentina national under-20 and under-17 sides by the Argentine Football Association. This caused some surprise as his résumé did not include any major achievements at this stage. He teamed up with Hugo Tocalli and coach Eduardo Urtasun. Pékerman's success, however, silenced the critics: his under-20 team won the FIFA World Youth Championship three times, 1995 (Qatar), 1997 (Malaysia), and 2001 (Argentina), thus giving the names to his three pet dogs - Qatar, Malaysia and Argentina. The team also won the two South American Youth Championships in 1997 and 1999. When the national coach Daniel Passarella resigned after the 1998 World Cup, Pékerman was offered his position. He declined, assuming instead the position of general manager of all national teams. Marcelo Bielsa was hired as coach on Pékerman's recommendation, and remained in charge until after Argentina's gold medal performance in the 2004 Summer Olympics. In 2003, Pékerman moved to Spain at the behest of Argentine businessman Daniel Grinbank, who had acquired Spanish Second Division side CD Leganés. After a few months serving as director of football, the project crumbled and Pékerman left Spain. When Marcelo Bielsa resigned as coach, Pékerman was one of the two candidates for the coaching job, alongside Carlos Bianchi, who had left Boca Juniors a few months earlier, and wanted to take a sabbatical year away from football. On 15 September 2004, Pékerman was named coach of the Argentine national team, which qualified for the 2006 World Cup. The nation dominated its initial two group stage matches and drew with the Netherlands in the third match, emerging on top of their group on goal difference. The Albicelestes then moved on to the round of 16, beating Mexico 2–1 after extra time in a comeback victory. In the quarter-finals, Argentina went ahead 1–0 against hosts Germany, but shortly before the end of the match, Germany equalised through a Miroslav Klose header. Germany would go on to win on penalties, sending Argentina out of the tournament. Pékerman made defensive substitutions, including taking off Juan Román Riquelme for Esteban Cambiasso, and after the loss, announced his resignation. Argentine Football Association (AFA) President Julio Grondona tried to dissuade Pékerman from leaving, but it was later announced that Alfio Basile, who had previously coached Argentina during the 1994 World Cup, would replace him as coach. 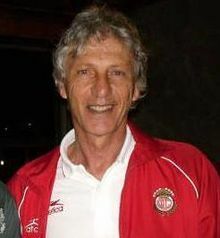 On 30 May 2007, Pékerman resumed his coaching career, taking up the position of head coach of Club Toluca in Mexico, replacing fellow Argentine Américo Gallego. At the end of the Clausura 2008 tournament, he was replaced by José Manuel de la Torre. On 23 February 2009, Pékerman was appointed as the head coach of UANL Tigres after the sacking of Manuel Lapuente following a series of bad results. After the end of Clausura 2009, however, he was terminated and replaced by Daniel Guzmán. In July 2010, it had been reported that Pékerman was in serious talks with the Australian national team, as well as talks with the Japanese national team about taking over the role as senior manager following the resignation of their managers. In January 2012, Pékerman became the new coach of the Colombian national team, replacing ousted coach Leonel Álvarez. Pékerman was the third coach of the Colombian team during the South American World Cup qualifiers; before Álvarez, Hernán Darío Gómez was at the helm. For his first match, a friendly against Mexico, Pékerman impressed, with the Colombians completely taking control of the friendly in an eventual 2–0 victory. In his first qualifying match for the 2014 World Cup, a struggling Colombia managed to win 0–1 over Peru in Lima. Pékerman, however, was criticized for using a long-range style of play rather than a close midfield passing control. This resulted in a weak Colombian side that lost to Ecuador 1–0 away from home, his first loss. In his home debut, Pékerman orchestrated an astonishing comeback as Colombia demolished 2011 Copa América champions Uruguay 4–0 in the seventh round of World Cup qualifiers. Under his direction, Colombia also won 1–3 away over Chile and 2–0 over Paraguay at home in Barranquilla. A few days later, Pékerman experimented without many star players such as Radamel Falcao and James Rodríguez against Cameroon, resulting in a comfortable 3–0 home victory. For the last match of 2012, Colombia drew 2014 World Cup hosts Brazil 1–1 despite missing two of the squad's star players. In the opening match of 2013, Pékerman experimented yet again, this time against the Guatemala side; he used only substitutes in a 4–1 victory, opting not to deploy senior stars, including Radamel Falcao. During the next round of qualifiers, Pékerman continued with the promising 4–2–2–2 formation that facilitated Colombia's comfortable defeat of Bolivia in a 5–0 home victory. Pékerman, however, decided to use a different formation in the match, 4–4–1–1, which led to a shocking 1–0 away loss to neighbours Venezuela. He was heavily criticized for experimenting with his side's formation, a loss that took the nation from second to third place in the qualifying table. In the match against his home nation Argentina, Pékerman changed the lineup and formation to better "deal" with the South American giants, which led to a hard-fought 0–0 draw. Despite this, Pékerman was again questioned with his lineup choices. After Colombia qualified for the 2014 World Cup after a 3–3 home draw against Chile, Pékerman expressed his joy for helping Colombia return to the World Cup for the first time in 16 years, considering it to be "one of the greatest joys in his life." Following Colombia's qualification, Pékerman received Colombian citizenship from Juan Manuel Santos, the president of Colombia. Colombia won all three of its group matches (scoring nine goals and conceding only two) and went on to defeat Uruguay in the Round of 16 before losing to the host nation of Brazil in the quarter-finals. In August 2014, Pékerman extended his contract with Colombia until 2018. For the second consecutive time, Pékerman qualified Colombia for the FIFA World Cup this time for the 2018 edition in Russia. Colombia suffered a controversial defeat in their first group stage game against a well organized and determined Japan, but then came out much stronger to inflict a 3-0 victory over Poland (effectively knocking them out of the tournament in the process). After beating Senegal 1-0 in the last game of the group stage, Colombia moved to the round of 16 as first in their group. After a bitter and contested match, Colombia lost on penalties to England. Pékerman is known for his tactical management style, often selecting the players that fit his style of coaching, regardless of how talented a player is. Pékerman can make controversial selections with line-ups against certain teams. He experimented heavily with the Argentinean youth squads when he was coaching them. Before the 2006 World Cup began, Pékerman made the controversial decision to drop established defenders Javier Zanetti and Walter Samuel. When Argentina was eliminated by Germany in the quarter-finals, his substitution decision caused storms of criticism, as well. Despite the dramatic loss, Pékerman was still hailed by many fans and press as a very effective coach and the "Pékerman Era" is regarded as one that brought a lot of pride to the country. His team lost its temper after the elimination and instigated a huge brawl, which was believed to be a major factor in his resignation. Pékerman was born in Villa Domínguez, Entre Ríos. His grandparents immigrated from Ukraine and settled in the Jewish agricultural colonies of Entre Ríos Province. Pékerman is Jewish. 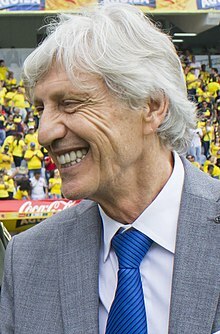 Following Colombia's qualification for the 2014 World Cup, Pekerman stated his desire to be a naturalized Colombian, which was granted by President Juan Manuel Santos the following day. ^ "Cápsulas de fútbol » El segundo apellido de Pekerman es Krimen". Ecbloguer.com. 22 February 1999. Retrieved 12 June 2014. ^ Featured Columnist (7 June 2013). "Argentina vs. Colombia: 6 Things We Learned from World Cup Qualifier". Bleacher Report. Retrieved 12 June 2014. ^ Diego, Juan. ""Es una de las mayores alegrías de mi vida": José Pékerman". ComuTricolor.com. Retrieved 12 June 2014. ^ a b webmaster. "José Pékerman será nacionalizado colombiano". ComuTricolor.com. Retrieved 12 June 2014. ^ "Pekerman signs new four-year deal to stay on as Colombia manager". Mail Online. Retrieved 12 October 2017. ^ "José Pekerman, el mejor DT de Sudamérica - Más Deportes - Diario Los Andes". Losandes.com.ar. Retrieved 12 June 2014. ^ "Scolari named among elite coaches". Goal.com. 28 January 2014. Retrieved 12 June 2014. ^ "Torneos FIFA Jugadores y Entrenadores - José PÉKERMAN". FIFA.com (in Spanish). Retrieved 12 October 2017. ^ "Colombia - Historical results". worldfootball.net. Retrieved 12 October 2017. ^ "Argentina - Historical results". worldfootball.net. Retrieved 12 October 2017. ^ "Argentina - International Matches in Era Pekerman 2004-2006". www.rsssf.com. Retrieved 12 October 2017. ^ Pelayes, Héctor Darío. "U-23 ARGENTINA NATIONAL TEAM - Matches & Statistics 1937-2008". www.rsssf.com. Retrieved 12 October 2017. ^ "Argentina [U20] - Historical results". worldfootball.net. Retrieved 12 October 2017. ^ "Jose Nestor Pekerman - Football Coach". Football-Lineups. Retrieved 12 October 2017. ^ "JOSE PEKERMAN:UN JUDIO ENTRERIANO | Periódico Judío Independiente". Delacole.com. 3 September 1949. Retrieved 12 June 2014. ^ New York Times, Pekerman's Journey. 27 June 2006. This page was last edited on 31 March 2019, at 06:09 (UTC).